Do you need an attorney to assist you in the preparation of a will or trust? A will is a set of instructions that explains how you want your property distributed after your death. In New Jersey, you must be at least 18 years old and of sound mind to make a will. Your will must be in writing and must be signed by you and two witnesses. Some people cannot serve as witnesses to your will. It is important to make sure that all of New Jersey’s legal formalities are carefully observed. A will allows you to decide who will manage your money and other property after you die, and how it will be distributed. The person you appoint to follow the wishes you set forth in your will, and who will locate your assets for distribution is know as the Executor of the will. The Executor is often a family member or trusted friend but can also be a business entity, such as a financial institution. The will lets your wishes be heard regarding the care of minor and disabled children and often prevents disputes among your relatives. In a large estate, a will can also reduce the amount of taxes that may be due at your death. 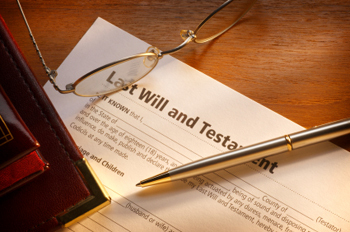 A will is an important legal document that can have a significant impact on your family. A lawyer can give you good advice on how the will should be prepared and executed. Having a lawyer draft your will gives you the assurance that your voice will be heard regarding how you want your spouse, children or other family members to be cared for and how you want your property to be distributed. If the formalities required to prepare and execute a will are not followed properly a court could reject the probate of the will, and your wishes as set forth in the will may not be followed. Rather, your estate will be distributed as set forth by law. The attorneys at Guberman, Benson & Calise can assist you in avoiding these mistakes, and helping you prepare and execute your will. A trust is another tool used in estate planning that can be created as part of a will or as a separate document. A trust is a legal document that appoints someone (a “trustee”) to manage your property and gives detailed instructions on how the property will be managed and distributed. A trust is one way to take care of a minor child, an elderly person or someone who needs help handling money. Should I consider having a medical advance directive and a power of attorney? Yes. A will only takes effect after you die. An advance directive and power of attorney are documents that may be used to manage your health care and finances while you are still living. A power of attorney may be created for any purpose, but most commonly an elderly person will nominate a close friend or family member to be their agent to help manage their money. Because this power can be abused, it is wise to seek the advice of a lawyer before signing a power of attorney. An advance directive is a document in which a person appoints a “health care representative” to make medical decisions such as living arrangements and treatment options when they become incapacitated and unable to make their own decisions. An advance directive can be used to indicate whether you wish to have life support, tube feeding or other heroic measures when you are close to death. A power of attorney and advance directive can be excellent end-of-life planning tools. Both documents expire at death, or can be revoked at any time.